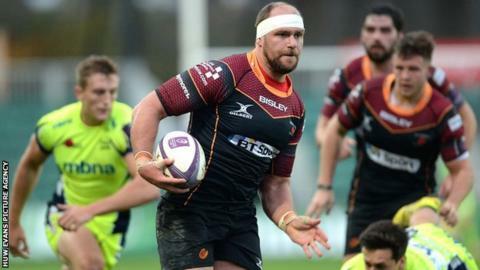 Newport Gwent Dragons can play without fear or pressure in Thursday's European Challenge Cup decider against Sale Sharks, says coach Kingsley Jones. The Dragons are already guaranteed a place in the last eight, but a win would secure top spot in Pool Two and a home quarter-final tie. Sale, two points behind in the table, can also win the pool with a victory. "We've got an opportunity to go through as one of the top teams and that's our aim," said Jones. "We want to keep that momentum going so let's have a go. We've got everything to gain and nothing to lose." Dragons beat Sale 30-12 in the opening pool game, capitalising on the English clubs' decision to field a weakened team at Rodney Parade. The Sharks have won every game since, and will be favourites to win the return leg that will secure top spot. If they lose, they could still make it through as one of the three best-runners up. "They will be a full tilt. It's important to them that they get through to the last eight," added Jones, who spent seven years as a coach at Sale. "They've got one foot in the quarter-final so they'll be going all-out to win and we'll be doing everything we can to quality top. "I'd like them to qualify as well being a former club, but for us we want to be as high as we can." Dragons prop Shaun Knight was at Gloucester last season when they won the Challenge Cup, but was not in the squad for the final when they beat Edinburgh. "It's nice going into the game knowing we've got a quarter-final, but the best chance to play in the semi-final, is a home game," he said. "The Sale game is a must-win game because of that, irrespective of other results. "We had a good victory over Sale at Rodney Parade, this will be a tougher test, but they are always tough."